Those of you who have been following this space know that I have been reporting on new drug and device treatments for wet age-related macular degeneration for the past several years. I haven’t paid much attention to the treatments under development for the dry form, basically because most are drug-related, and my knowledge of how drugs work is limited. However, I recently read an excellent overview of the new drugs that are being developed for dry AMD, written by Dr. Philip Rosenfeld (the father of Avastin for use in AMD) and John Legarreta, a medical student at State University of New York at Buffalo, which presents a clear picture of current developments in this important field. I have previously written about the potential for the use of lasers to treat dry AMD by Iridex, but that attempt did not prove successful. I have also written about the Ellex 2RT (retinal regeneration) program that might hold potential in the early intervention in dry AMD. Links to both of these writeups are shown at the end of this posting. Philip J. Rosenfeld, MD, PhD, is professor of ophthalmology at the Bascom Palmer Eye Institute at the University of Miami Miller School of Medicine in Florida. He receives significant research support from Potentia and Alexion, and he has a minimal advisory relationship with Potentia. John Legarreta, BFA, is a medical student at the School of Medicine and Biomedical Sciences, State University of New York at Buffalo. He has no financial interest in any products mentioned in this article. Dr. Rosenfeld can be reached at prosenfeld@med.miami.edu. The vast majority of AMD patients have the nonexudative or dry form of the disease, characterized by a constellation of clinical features, including drusen, disturbances of the retinal pigment epithelium (pigment clumping and/or dropout), and geographic atrophy (GA) of the macula. As defined by the Age-Related Eye Disease Study (AREDS), the severity of AMD can be classified into three categories: early, intermediate, and advanced. The second issue that has hampered drug development is the uncertainty surrounding the best molecular pathway to target for the treatment of dry AMD. However, several different strategies have evolved. These strategies have targeted three major therapeutic areas of investigation: preservation of photoreceptors and the RPE (neuroprotection), prevention of oxidative damage, and suppression of inflammation. Each strategy is supported by varying degrees of scientific evidence and will have to await validation based on clinical trial outcomes. The most obvious study endpoint for dry AMD therapies would be the preservation of visual acuity; however, studies using visual acuity as an endpoint will take many years to complete. To decrease the time required to show a benefit from a drug, surrogate endpoints have been developed that might indicate a positive outcome without waiting the years required to show visual acuity benefit. One surrogate endpoint is the prevention of disease progression from dry to wet AMD. This endpoint was first used in the study investigating anecortave acetate (Retaane, Alcon) for the treatment of dry AMD. While the drug failed to prevent progression of dry to wet AMD, the study demonstrated the feasibility of this study design. Another strategy is to assume that a treatment for dry AMD might also affect the underlying stimulus for neovascularization in wet AMD. If true, then a potential endpoint might be to demonstrate that a drug for dry AMD is able to decrease the need for retreatment with antiangiogenic therapy in wet AMD or improve the visual acuity outcome. This study design has not been tested. No matter what the underlying cause of AMD, drugs that can preserve viable photoreceptors and maintain the RPE should preserve vision. One strategy to promote survival of photoreceptors and the RPE is to protect cells against ischemia and improve the choroidal circulation in patients with dry AMD. Two studies are currently using this strategy. In Europe, an ongoing multicenter, randomized, placebo-controlled study is investigating the use of an offlabel, generic drug known as trimetazidine (Vastarel MR, 35 mg tablet), a drug currently used for the treatment of angina pectoris. Trimetazidine improves myocardial glucose utilization by stopping fatty acid metabolism, and it is considered to have cytoprotective effects in ischemic conditions. Other uses for this drug include the treatment of vertigo, tinnitus, and vision loss and visual field loss due to vascular causes. The primary goal of this study is to slow the conversion of dry AMD to wet AMD. Another drug being investigated for its vasodilatory effect is Alprostadil, also known as prostaglandin E1 (PGE1). The presumed rationale is based on the belief that improved circulation would slow the progression of AMD. This multicenter, randomized, placebo-controlled study is ongoing in Europe. Another strategy to preserve the macular function is to prevent apoptosis by using neuroprotective agents. Ciliary neurotrophic factor (CNTF), a potent neuroprotective agent, has been shown to inhibit photoreceptor apoptosis in an animal model of retinal degeneration (8) and is being investigated as a treatment for dry AMD. Using encapsulated cell technology that permits CNTF-producing transfected cells to be implanted into the vitreous cavity, Neurotech Pharmaceuticals (Lincoln, RI) has developed a sustained-release platform that produces CNTF for a year or longer. The phase 2 study is completed and data analysis is currently under way. Other neuroprotective agents currently under investigation for dry AMD include a brimonidine tartrate intravitreal implant (Allergan, Irvine, CA) and topical tandospirone (Alcon, Fort Worth, TX). Yet another strategy is to interfere with the normal visual cycle and preserve vision by decreasing the accumulation of toxic metabolites, such as lipofuscin and the retinal fluorophore A2E. This strategy is being pursued by Sirion Therapeutics (Tampa, FL) with the use of fenretinide - N-(4-hydroxyphenyl) retinamide - for the treatment of dry AMD. Fenretinide binds retinol-binding protein in the circulation and prevents uptake of retinol by the RPE, thus downregulating photoreceptor metabolism. The phase 2 study investigating fenretinide for the treatment of GA is fully enrolled and in its second year of follow-up. Downregulation of photoreceptor activity is also being investigated using the drug ACU-4429 (Acucela, Bothell, WA). ACU-4429 is a small nonretinoid molecule that functions as a modulator of the isomerase (RPE65) required for the conversion of all transretinol to 11-cis-retinal in the RPE. By modulating isomerization, ACU-4429 slows the visual cycle in rod photoreceptors and decreases the accumulation of A2E. The ongoing phase 1 study has shown so far that the drug is safe and well tolerated in healthy volunteers. A phase 2 study for treatment of dry AMD is currently being planned. A novel strategy for the preservation of photoreceptors and the RPE borrows a therapeutic strategy used for the treatment of Alzheimer's disease. An antibody against amyloid ß has completed a phase 1 study as an intravenous treatment for GA in AMD patients. This antibody, known as RN6G (Pfizer, New York, NY), was shown to decrease the amount of amyloid ß in the eye from a mouse model of AMD when given as a systemic therapy. (9) A phase 2 study is currently under way. 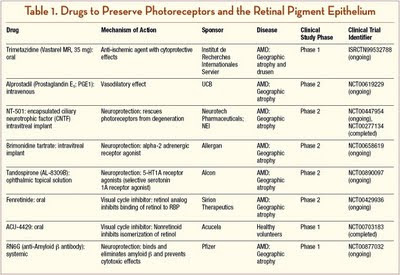 The therapies under investigation that seek to preserve photoreceptors and the RPE are summarized in Table 1. The AREDS2 trial, now under way, is designed to evaluate the effect of dietary xanthophylls (lutein/zeaxanthin) and/or omega-3 long-chain polyunsaturated fatty acids (LCPUFA), known as docosahexaenoic acid (DHA) and eicosapentaenoic acid (EPA), on the progression to advanced AMD (www.areds2.org). These micronutrients are believed to function not only as antioxidants, but also as anti-inflammatory and antiangiogenic agents, according to epidemiologic and laboratory studies. In addition, AREDS2 will investigate the effects of eliminating betacarotene and the effects of reducing zinc in the original AREDS on the development and progression of AMD. A topical antioxidant called OT-551 (Othera Pharmaceuticals, Exton, PA) was being explored as a treatment for dry AMD. OT-551 (4-cyclopropanoyloxy- 1-hydroxy-2,2,6,6-tetramethylpiperidine HCl) is a small lipophilic molecule that readily penetrates the cornea. OT-551 is converted by ocular esterases to TEMPOL-H (TP-H), the active metabolite that is a potent free-radical scavenger that does not penetrate the cornea. In animal studies, topical therapy has resulted in excellent ocular bioavailability, with significant levels of TP-H achieved in the retina. The drug OT-551 was shown to possess antiinflammatory and antiangiogenic properties, as well as antioxidant properties. OT-551 was also shown to protect against oxidative damage in vitro, protect against light damage in vivo,(13) suppress photoreceptor cell death in animal models, and block angiogenesis stimulated by growth factors. Based on these preclinical data, OT-551 was being investigated as a therapy for GA in AMD. This two-year, phase 2 trial, known as the OMEGA (OT-551 Multicenter Evaluation of Geographic Atrophy) study, was stopped after 18 months, due to an apparent lack of efficacy in preventing the enlargement rate of GA in AMD. The therapies under investigation that seek to prevent injury from oxidative stress and micronutrient depletion are summarized in Table 2. Genetic association studies using different populations have shown that inflammation appears to be the driving force behind AMD. (14) In 2005, four groups identified a genetic polymorphism in complement factor H (CFH), which was associated with an increased risk of developing AMD. (15-18) The documented risk-conferring single-nucleotide polymorphism (SNP) was a thymine (T) to cytosine (C) substitution at nucleotide 1277 in exon 9, which results in a tyrosine-to-histidine change at amino acid position 402 (Y402H) of the CFH protein. These genetic association studies would imply that inhibition of complement activation would be a reasonable strategy for the treatment of AMD. However, after a lifetime of complement-mediated damage, such a strategy might have no effect on disease progression later in life. One drug being investigated is POT-4 (Potentia Pharmaceuticals, Louisville, KY), a cyclic peptide comprised of 13 amino acids, that is derived from compstatin. POT-4 binds reversibly to complement component 3 (C3) and prevents its proteolytic activation to C3a and C3b and the subsequent release of all downstream anaphylatoxins, as well as the formation of terminal membrane attack complex. As a C3 inhibitor, POT-4 inhibits all three major pathways of complement activation. POT-4 has unique slow-release properties due to the formation of an intravitreal gel at higher doses, which should permit less frequent intravitreal injections to achieve prolonged complement inhibition. The phase 1 dose-escalation study, known as Assessment of Safety of Intravitreal POT-4 Therapy for Patients with Neovascular AMD (ASaP), was performed on patients with advanced neovascular lesions with the intention to pursue POT-4 as a treatment for dry AMD. To date, POT-4 appears safe up to a dose of 1.05 mg, with evidence of efficacy at the higher doses. Another complement inhibitor under investigation is eculizumab (Soliris, Alexion Pharmaceuticals), a humanized monoclonal antibody derived from a murine antihuman C5 antibody. Eculizumab specifically binds the terminal complement protein C5, thereby inhibiting its cleavage to C5a and C5b during complement activation. The strategic blockade of the complement cascade at C5 prevents the release of the downstream anaphylatoxin C5a and prevents the formation of the cytolytic membrane attack complex. Eculizumab is FDA-approved for the intravenous treatment of another complement-mediated disease known as paroxysmal nocturnal hemoglobinuria. At the Bascom Palmer Eye Institute, we are performing a phase 2 investigation with eculizumab for the treatment of patients with dry AMD, known as the COMPLement Inhibition with Eculizumab for the Treatment of Non-Exudative Age-Related Macular Degeneration (COMPLETE) Study. Patients with GA or high-risk drusen are being randomized 2:1 to receive intravenous infusions of eculizumab or placebo. Ophthotech's ARC-1905 (Princeton, NJ), an anti-C5 aptamer, is another complement inhibitor being tested in AMD. ARC-1905 is being administered by intravitreal injection. The phase 1 dose-escalation study was performed in combination with ranibizumab therapy for the treatment of wet AMD. Genentech/Roche are developing an anti-Complement Factor D antibody Fab (FCFD4514S), which is in a phase 2 trial. Another phase 1 study using ARC1905 for dry AMD is currently under way. Another complement inhibitor in preclinical studies is JPE1375 (Jerini Ophthalmic, New York, NY), a small, peptidomimetic molecular antagonist against the C5a receptor, which prevents binding of C5a, thus inhibiting the biological activity of C5a. Additional complement inhibitors are being pursued in preclinical studies by several companies, but details are not yet available. More generalized immune suppression for the treatment of dry AMD is being pursued with the use of subcutaneous glatiramer acetate (Copaxone, Teva Pharmaceuticals, Kfar- Saba, Israel), intravitreal sustained-release fluocinolone acetonide (Iluvien implant, Alimera Sciences, Alpharetta, GA), and subcutaneous sirolimus (rapamycin), a macrolide fungicide with immunosuppressive properties. 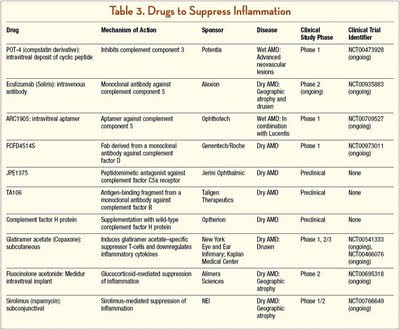 The therapies under investigation that seek to suppress inflammation are summarized in Table 3. 1. Ferris FL, Davis MD, Clemons TE, et al. A simplified severity scale for agerelated macular degeneration: AREDS Report No. 18. Arch Ophthalmol. 2005;123:1570-1574. 2. A randomized, placebo-controlled, clinical trial of high-dose supplementation with vitamins C and E, beta carotene, and zinc for age-related macular degeneration and vision loss: AREDS report no. 8. Arch Ophthalmol. 2001;119:1417-1436. 3. Kaidzu S, Tanito M, Ohira A, et al. Immunohistochemical analysis of aldehydemodified proteins in drusen in cynomolgus monkeys (Macaca fascicularis). Exp Eye Res. 2008;86:856-859. 4. Laser treatment in patients with bilateral large drusen: the complications of age-related macular degeneration prevention trial. Ophthalmology. 2006;113:1974-1986. 5. Friberg TR, Musch DC, Lim JI, et al. Prophylactic treatment of age-related macular degeneration report number 1: 810-nanometer laser to eyes with drusen. Unilaterally eligible patients. Ophthalmology. 2006;113:622 e1. 6. Owens SL, Bunce C, Brannon AJ, et al. Prophylactic laser treatment hastens choroidal neovascularization in unilateral age-related maculopathy: final results of the drusen laser study. Am J Ophthalmol. 2006;141:276-281. 7. Csaky KG, Richman EA, Ferris FL 3rd. Report from the NEI/FDA Ophthalmic Clinical Trial Design and Endpoints Symposium. Invest Ophthalmol Vis Sci. 2008;49:479-489. 8. Tao W, Wen R, Goddard MB, et al. Encapsulated cell-based delivery of CNTF reduces photoreceptor degeneration in animal models of retinitis pigmentosa. Invest Ophthalmol Vis Sci. 2002;43:3292-3298. 9. Ding JD, Lin J, Mace BE, et al. Targeting age-related macular degeneration with Alzheimer's disease based immunotherapies: anti-amyloid-beta antibody attenuates pathologies in an age-related macular degeneration mouse model. Vision Res. 2008;48:339-345. 10. Risk factors associated with age-related macular degeneration. A case-control study in the age-related eye disease study: Age-Related Eye Disease Study Report Number 3. Ophthalmology. 2000;107:2224-2232. 11. Canter JA, Olson LM, Spencer K, et al. Mitochondrial DNA polymorphism A4917G is independently associated with age-related macular degeneration. PLoS One. 2008;3:e2091. 12. Tuo J, Ning B, Bojanowski CM, et al. Synergic effect of polymorphisms in ERCC6 5' flanking region and complement factor H on age-related macular degeneration predisposition. Proc Natl Acad Sci U S A. 2006;103:9256-9261. 13. Tanito M, Li F, Elliott MH, et al. Protective effect of TEMPOL derivatives against light-induced retinal damage in rats. Invest Ophthalmol Vis Sci. 2007;48:1900-1905. 14. Patel M, Chan CC. Immunopathological aspects of age-related macular degeneration. Semin Immunopathol. 2008;30:97-110. 15. Edwards AO, Ritter R, 3rd, Abel KJ, et al. Complement factor H polymorphism and age-related macular degeneration. Science. 2005;308:421-424. 16. Hageman GS, Anderson DH, Johnson LV, et al. A common haplotype in the complement regulatory gene factor H (HF1/CFH) predisposes individuals to age-related macular degeneration. Proc Natl Acad Sci U S A. 2005;102:7227-7232. 17. Haines JL, Hauser MA, Schmidt S, et al. Complement factor H variant increases the risk of age-related macular degeneration. Science. 2005;308:419-421. 18. Klein RJ, Zeiss C, Chew EY, et al. Complement factor H polymorphism in agerelated macular degeneration. Science. 2005;308:385-389. 19. Maller JB, Fagerness JA, Reynolds RC, et al. Variation in complement factor 3 is associated with risk of age-related macular degeneration. Nat Genet. 2007;39:1200-1201. 20. Yates JR, Sepp T, Matharu BK, et al. Complement C3 variant and the risk of age-related macular degeneration. N Engl J Med. 2007;357:553-561. 21. Gold B, Merriam JE, Zernant J, et al. Variation in factor B (BF) and complement component 2 (C2) genes is associated with age-related macular degeneration. Nat Genet. 2006;38:458-462. 22. Fagerness JA, Maller JB, Neale BM, et al. Variation near complement factor I is associated with risk of advanced AMD. Eur J Hum Genet. 2009;17;100-104. 23. Ennis S, Jomary C, Mullins R, et al. Association between the SERPING1 gene and age-related macular degeneration: a two-stage case-control study. Lancet. 2008;372:1828-1834. 24. Dinu V, Miller PL, Zhao H. Evidence for association between multiple complement pathway genes and AMD. Genet Epidemiol. 2007;31:224-237. 25. Hughes AE, Orr N, Esfandiary H, et al. A common CFH haplotype, with deletion of CFHR1 and CFHR3, is associated with lower risk of age-related macular degeneration. Nat Genet. 2006;38:1173-1177. Laser Treatments for AMD Show Promise; Ocular Surgery News, January 15, 2000. Check out the following website and watch the webinar. You can also link to the clinical study from this site. You left off the website. Please send it to me: iarons@erols.com and I'll check it out.